The first Extravaganza was held at the Wunderbar, Lyttelton and featured 'quick fire' rounds from ChCh Poetry Slam champs interspersed with open mic sections and featured guest poets. Truly an extravaganza of spoken word. The quick fire rounds saw the poets set about trying to outdo each other but without the judging element of scorecards etc. - just good old-fashioned oneupmanship. The night also features a 'drinks with the poets' time pre-show as the late afternoon sun dips down over Hagley Park, be there from 5pm to join the hang out. Drinks from 5pm, show starts 6pm sharp. Merry Christmas and Happy New Year to y'all! 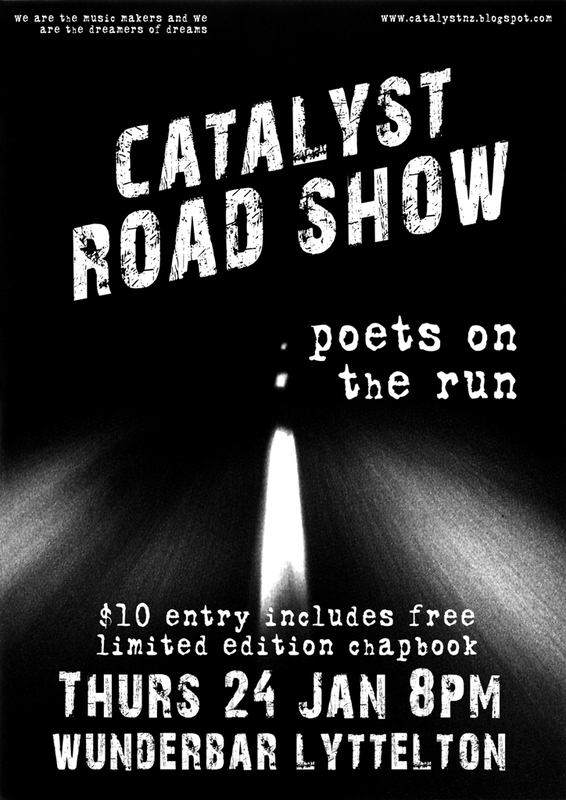 We're kicking off 2013 with a bang and introducing a new series of poetry shows - Catalyst Road Show. Yes, we're still going to be doing the open mics this year - starting off in February - but we just couldn't wait to get into it and launch our brand new baby. Each Catalyst Road Show will happen in a different place - kind of like a tour, both in and out of Christchurch, and featuring an ever-evolving line up of poets and music. A poetic, musical mystery tour curated by Catalyst and where else to kick things off than at our spiritual home - The Wunderbar! Entry fee ($10) includes a limited edition zine showcasing the featured poets - from the stage to the page. Catalyst Road Show - Lyttelton, features the talents of Andrew Coyle, Ben Brown, Kimberley Holmes, Ciaran Fox and Doc Drumheller.